For the first time ever, ladyironchef is introducing its merchandise and we chose the Lunar New Year for our inaugural merchandise because the festivity is all about getting together with your loved ones to feast over good food! Introducing LIC Pineapple Truffles, we have given the traditional pineapple tarts a makeover and added a modern touch with flavours that us Singaporeans can relate to and love. 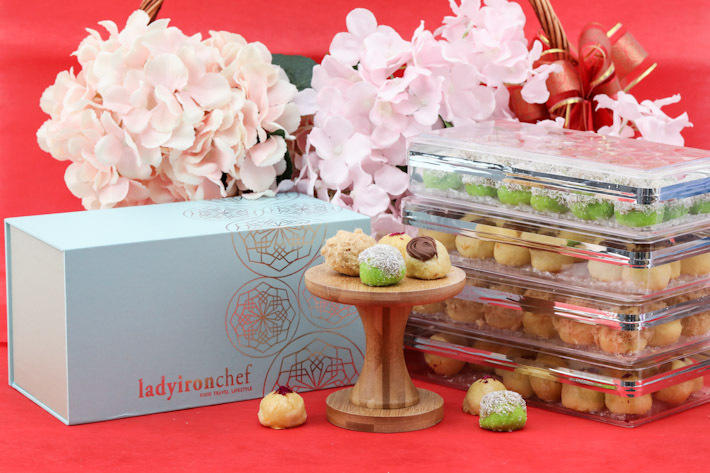 Supported by our friends at Creme Maison Bakery, we bring you to these exclusive Pineapple Truffles at only S$58 for 2 flavours (18 pineapple truffles per flavour) and they come packed together in one blue box. The flavours available are French Rose, Nutella Swirl, Pandan Kaya and Chicken Floss. Preorder starts now and we are offering a 15% discount for early birds—valid from now until 22 Jan 2019. Corporate orders are welcome too! Chinese New Year is just a couple of weeks ahead and we are sure that many of us are excited to spend some quality time with your family and loved ones. But besides the wholesome gatherings, this is also the perfect season (or so we deem to be) to put on hold any existing diet and instead, indulge in those festive goodies non-stop. But feasting during Chinese New Year shouldn’t stop at just bak kwa and pineapple tarts. This Lunar New Year, ushering in the year of the Pig in the best possible way is Ginger at PARKROYAL On Beach Road, an all-day dining destination and one of our favourite venues to dine at regardless of the occasion. Executive Chef Vincent Aw and the team has thoughtfully curated an extensive array of auspicious culinary delights which will be presented as part of their buffet line-up come 21st January 2019. Think D.I.Y Yu Sheng, Singaporean-favourite crabs and divinely crispy roasted suckling pig! Our red packet to our readers consists of a discount for this feast this upcoming Lunar New Year. Quote ‘LICCNY’ upon making reservations at Ginger at PARKROYAL on Beach Road to enjoy 25% off from 21 Jan to 3 Feb and 7 to 19 Feb; as well as 15% off from 4 to 6 Feb.
KFC’s New Parmesan Truffle Chicken Is Its Best Seasonal Item Yet! Ushering the year of the Pig in the best possible way, KFC introduces their new Parmesan Truffle Chicken. A unique creation that combines Singaporean’s all-time favourite truffle with parmesan cheese. Crispy from edge to edge and boasting a heady aroma of both savoury parmesan and nuanced truffle, this fried chicken delight is a luxury that’s fit for any festive gathering. Available from 11 January 2019 onwards islandwide, this is one KFC offering not to be missed! Ladyironchef is hiring for 2019. New year, new you. New resolutions, new job. Be a part of our family and be paid to eat and travel! Our office has a few tables to fill and we are looking for new writers and videographers with fresh perspectives and sales persons who can bring more money to the company so that we have more fund to stock up on our alcohol cabinet. Just to put it out there, we are no typical office. We don’t report to work at 9am in the morning each day, glue ourselves to our computers and slog it out till 6pm only to repeat the same draining cycle again and again until we eventually turn senile. Instead here at the Ladyironchef office, we sip wine in the afternoon, play games whenever we feel like it and work only when we need to. 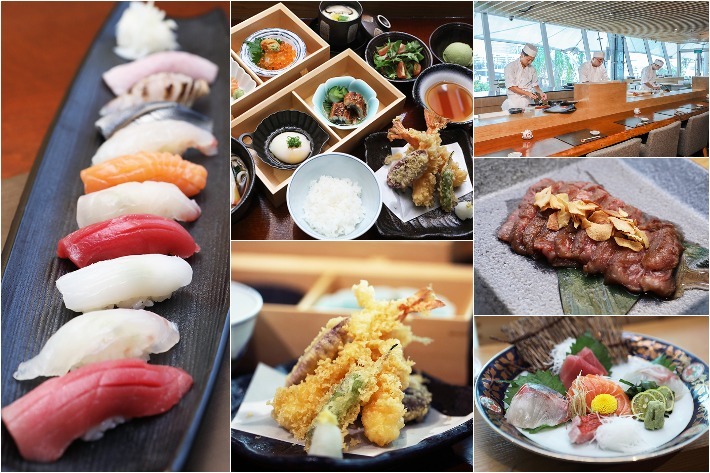 On other days when we’re not too busy ‘working-hard-for-a-living’ we go out for tastings where we eat, eat and eat some more. Sounds like the sort of job you want to be doing? Read on to find out how you can join us! When it comes to classic spirits, rum may not come first in your mind, as compared to say fine scotch, nor is it a spirit associated with crazy wild parties. In that grey area between classy and crazy, rum is a spirit that sits in between. You may associate rum with the beach and tiki bar cocktails—and you’d be right to think so. Few spirits can make a beach cocktail like rum can. Period. In fact, rum, which is made from sugar cane, is the key ingredient to many of the classic tiki cocktails. A versatile spirit, rum is one of those things that can taste excellent in a cocktail given its complexity of flavour notes, but few would agree that having it neat or on the rocks would be ideal—until now. Having won several prestigious awards and the hearts of many abroad, Don Q is set to make a smooth yet assertive entry—much like their rums—into the Asia Pacific region with their portfolio of premium rums that boast distinctive bouquets, tasting notes and balance. We tried it for ourselves and were utterly blown away by the sheer smoothness of it. Our readers can use our code ‘LADYIRONCHEF’ to get 10% off Don Q’s rums on Club Parcel Santa with a minimum spending of S$100. A spirit that comes with the promise of versatility, fragrant complexity, excellent taste and a clear subtlety that’s unmatched, Don Q is, hands down, our newest go to. And here’s why it should be yours too! Located in Yishun Town Square, newly-opened Qi Lai Feng specialises in fish pots, both dry and soup versions, as well as hot pot. The beauty in eating fish pots is that one gets to choose their preferred fish and here, they offer anything from their signature Q fish, dory to toman fish. Having spent a great deal of time abroad and eating their way through China, the founders decided to bring it back here, after realising that many of popular hot pot restaurants in Singapore lacked the proper technique, the flair and the wide variety that authentic grilled fish dishes is supposed to have. By marrying the authentic flavours and lip-smacking spices of Sichuan cuisine which take on a more fragrant complexity rather than being overly fiery, it is the restaurant’s distinctive fish pot flavours coupled with their use of fresh ingredients that allow this humble restaurant to resonate with diners. Some of their notable fish pot flavours include their dry signature Spicy Fragrant Fish Pot, Jade Pepper Fish Pot and soup versions such as their Gold Soup Lemon Fish Pot and Tomato Vitamin C Fish Pot. Ensuring a flavour-packed dining experience that promises good value for exceptional food, Qi Lai Feng in Yishun is one that warrants a visit. From now until 31 January 2019, our readers can enjoy 50% OFF for all fish pots only at Qi Lai Feng between Mondays to Fridays and 30% OFF on weekends. In a tropical, almost unforgivably humid country like Singapore, ice cream is essential. And fortunately for us, there are lots of ice cream options to choose from, from artisanal ice cream parlours, convenience store varieties and even those sold on carts along Orchard Road. At its heart, ice cream is merely a composition of milk and cream but what sets a good one apart from a great one is the quality of the ingredients used and the careful manipulation of sweetness and richness. A brand that never fails to exceed expectations, presenting an intensely pleasurable experience with every lick, is Häagen-Dazs. In the spirit of Christmas, the colossal brand has released two limited edition flavours—Cream Cheese Mochi and Tiramisu Mochi. An extraordinary marriage between traditional Asian mochi and European desserts, each and every soft, pillowy morsel presents a flavour and textural profile that far surpasses the common ice cream dessert. For an amplified experience, head on down to one of their stores to enjoy full-on crafted desserts featuring the two seasonal offerings such as the So Mochi Together Fondu and the oh-so-gorgeous Gondola Tiramisu. A duo that aims to bring joy and sheer decadence to both the young and the old, what better way to soak up the festive Yule, than to cosy up around your loved ones, sharing and indulging in top-quality ice cream?